Tanyawan City Home. 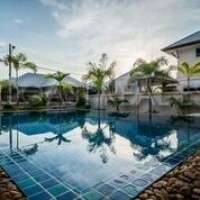 This new modern family houses is located a short distance East across the Sukhumvit Highway, and only 10 minutes from Downtown Pattaya City, with easy access to all locations. The house itself consists of the usual 3 bedrooms, and 4 bathrooms (3 en-suite bedrooms). It is sold un-furnished, so the prospective buyer must account for further costs to turn the house into a livable home. The village has a large communal swimming pool to enjoy. Ownership is currently in a Thai company, so it is quick and easy to transfer.